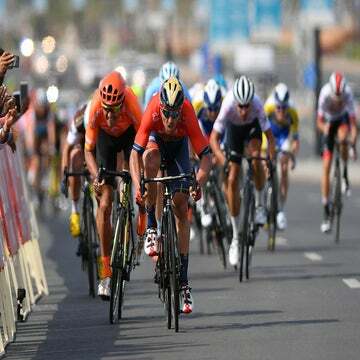 AL WUTAYYAH, Oman (AFP) — Italy’s Andrea Guardini (Astana) sprinted to victory on Tuesday’s opening stage of the 2015 Tour of Oman. Guardini crossed the line first in the mass sprint to claim his first win of the season ahead of Belgium’s Tom Boonen (Etixx-Quick-Step) and Italy’s Matteo Pelucchi (IAM Cycling). “My time finally came. I was really good in Qatar. I’ve been in good shape since the start of the season in Dubai when I came close to a win,” said the Italian, who finished second twice in the Emirate and grabbed second and third-place finishes in Dubai. Hot temperatures welcomed the riders of the 2015 Tour of Oman for the first stage. In the first kilometers of racing, four men broke away: Johann Van Zyl (MTN-Qhubeka), Jef Van Meirhaeghe (Topsport Vlaanderen-Baloise), Patrick Konrad (Bora-Argon 18), and Simone Andreetta (Bardiani-CSF). Their lead grew to a maximum of 5:15 after 17 kilometers, but Katusha soon started chasing. The gap dropped down to 3:15 by the first intermediate sprint (47.5km), won by Konrad ahead of Van Meirhaeghe and Andreetta. As the field drew closer, Van Zyl decided to take off on his own after 76 kilometers. The South African reached the second bonus sprint (87km) with a one-minute lead over his former breakaway companions and 4:10 over the pack. Van Meirhaeghe, Konrad, and Andreetta were later caught after 93km of racing, while Van Zyl continued his solo effort. He was finally caught with 35 kilometers to go. 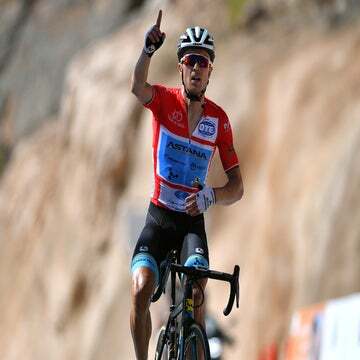 After the long road to Muscat, Guardini powered to the line, claiming his first-ever win in Oman. Guardini will wear the red leader’s jersey after his victory in the 161-kilometer stage from Bayt Al Naman Castle to Al Wutayyah. Due to time bonuses, Guardini leads Boonen by four seconds, with Austria’s Patrick Konrad (Bora-Argon 18) third overall at five seconds back. Patrick Konrad claims the white jersey for the best young rider as well as the red and green polka-dot jersey, having earned the most points at the intermediate sprints. Wednesday’s stage 2 runs from Al Hazm Castle to Al Bustan over a distance of 195km.